Every year, over 50% of the new product and service introductions are pulled from the market because they did not meet financial expectations. WHY? The reason is that they did not resonate with their customers. Either they did not satisfy the customer needs as well as their competitors or else they were not designed around customer needs at all. The addage that "customers do not know what they want until they are shown" should not be left until the final release of end products or services. After spending precious time and millions of dollars on the development of your new product or service, you do not want to find out at launch that you completely missed the market. Yet, as the above statistics show, well over 50% of companies do just that. The Design Thinking framework starts by gaining an understanding of customer pain points and unmet needs. Those needs are then reframed into Jobs To Be Done and Outcome Expectations to more clearly define what customers desire. Next brainstorming is conducted to identify numerous potential solutions. This is followed by creating fast, inexpensive MVP prototypes to demonstrate and test the concepts with customers to obtain rapid feedback that can be used to further refine the product or service. 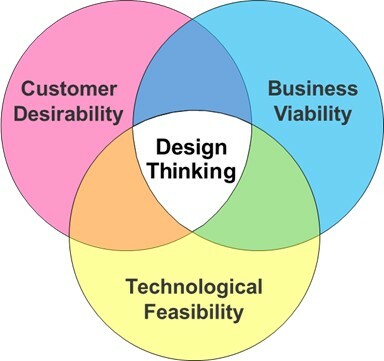 Design Thinking is the intersection of Customer Desirability, Business Viability, and Technological Feasibility. All three are needed for success. Without Customer Desirability, you have no customers. Without Business Viability, you have no profits. And without Technological Feasibility, you have no product or service. Design Thinking, together with Lean Startup, weaves all three of these together in a harmonious way and maximizes your likelihood of success.